WHY IS IT CALLED BIG SIS LITTLE DISH? This blog was started by my younger half-sister, Silvi, in July of 2010 as a way for us to share and store recipes and food stories. The idea was that it would be a way for us to continue to cook together even though we live on opposite ends of the continent. My name is Erin K Orr. I spent my early childhood in Canada on the farms of my loving Irish and Estonian grandparents. I moved to Hawaii at age 9, when my young, free-spirited mother married my adventurous step dad who had sailed to Maui on his boat. I have now lived in New York City for about 20 years. I’m married to a Tennessee man with strong family connections to India. I have no formal training as a cook, but I have spent a ridiculous amount of my life thinking about and preparing food. I’m a professional puppeteer, storyteller, arts educator, food blogger and chef. For the last couple of years my food and theater interests have found a shared home as the chef for the Illuminati Ball. WHAT ABOUT THE LITTLE SIS? Silvi lives in Vancouver and is making artisanal chocolate, working on an organic farm, studying to become an engineer, singing in an Estonian Choir and doing burlesque. She still posts very occasionally. I highly recommend her posts on how to make experimental economical vegetable stock, advice on how to improvise a stir fry and how to cook the wild plantain or myrtle berries that you might have growing in your yard. I’ve decided that Big Sis little Dish is still good name for the blog, even though my little sister does not post so often anymore. I am still a big sister, and I still want to use this blog as a way honour food memories and create community through food with whoever wants to come to the table. WHAT IS THE STORY WITH ALL THESE RECIPES? WHAT KIND OF FOOD DO YOU MAKE? I gave up gluten entirely in 2008 after 10 years of trying to find a way to work around the fact that wheat made me feel very ill. Baking had been my superpower, and it made me very angry to have to relearn how to do it without gluten. However, by the time we started the blog I was getting the hang of gluten-free baking and was happy to share what I had figured out with other people who were facing the same challenges that had. I usually include instructions for how to make the same dish with all-purpose wheat flour as well. Just because I can’t use my old baking recipes doesn’t mean someone else shouldn’t! My sister has no trouble with gluten, so some of her recipes use wheat flour. I am not a vegetarian or vegan myself, although many people who I love (including my sister) are. Given my own dietary restrictions I am very sympathetic to folks who have various allergies and sensitivities. I love to cook for others and the idea that anyone would be unable to eat my food makes me sad, so a lot of what I make these days is both gluten-free and vegan. I am not a dieter and having been raised around hippies I am generally skeptical of health food. That said, it is hard to escape your upbringing and I do end up eating pretty healthy at the end of the day. I do not subscribe to any particular way of eating as being correct for everyone. I just write about the food that I enjoy and that makes me feel good. I hope that some of the recipes will be useful to others as well. focuses on seasonal fruits and vegetables. features lots of gluten-free baking using a wide variety of flours from grains, seeds, tubers and nuts. is pretty high in fat from nuts, butter, oil and duck fat when I can get it. is made from scratch and rarely uses any pre-prepared ingredients. This helps keep food costs down, and rarely takes as much time as people think. Also, as much as it does not suit my personality to be a picky eater, I have inherited a tender gut that does not respond well to industrial food-like mystery ingredients. occasionally uses odd or hard to find ingredients. I am curious by nature and live in a city where every weird ingredient can be had. I usually suggest substitutions. only rarely uses very expensive luxury ingredients, since I’m not particularly wealthy. Is often vegetarian or vegan because I like to feed EVERYONE. would include more recipes for meat and seafood, if I could afford to buy it more often. Being raised eating meat that my grandparents lovingly raised and butchered themselves I am picky about where I buy my meat from, and properly raised meat is expensive. I consider myself a very good meat cook though, so please do try the few recipes that I have posted! includes influences from diverse cuisines where my husband and I have lived, travelled or have family connections. Some of the recipes are original and some have been adapted from excellent cookbooks or food blogs. It is always tricky to determine the point at which a recipe is “yours”. I link to recipes that I used as a source material. Me, unless a different photographer is listed in the photo description. My sister also took some of the photos for her posts. HOW ARE THESE RECIPES ORGANIZED? 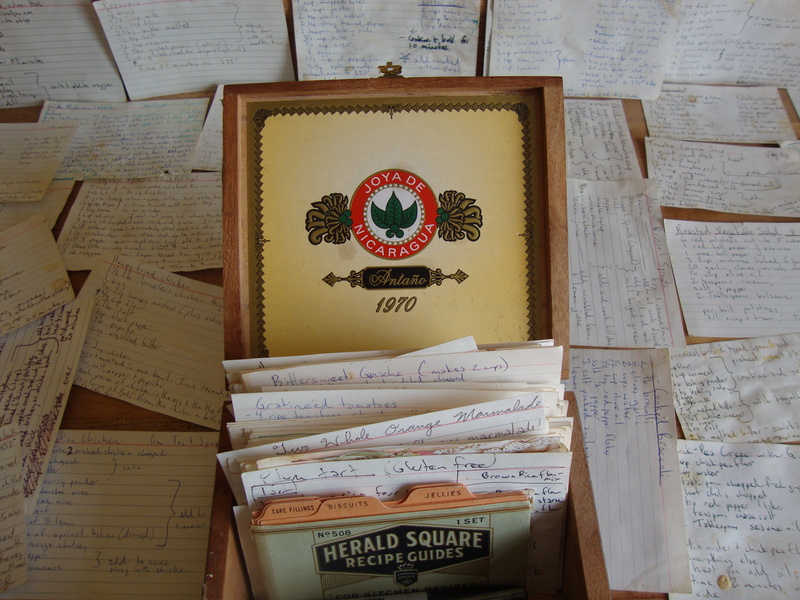 Before starting this blog, my system for archiving the recipes that found or invented looked the picture below. Now there is a recipe index. You can also use the search feature in the upper right corner. Thank you for your kind words and for giving us an award! I am feeling all warm and appreciated and stuff. Hi Erin and Silvi! Because I truly love reading your blog and checking out your inspiring pictures, I’ve nominated you for the Lovely Blog Award. Check out my blog for more information! Thank you so much! Now to see if I can figure out how it works myself! Haven’t tried any of the recipes yet, but the photography is great. The writing is good, too. Nice layout. Really well done, Erin & Silvi. Hi, this is Vihren. Your blog is awesome! The pictures are beautiful! I want to make everything on here! Too bad free time and ingredients are not easy to access for me now… Erin, I loved your show and talking to you and Chris this past Friday! I am so happy that you like the blog! We enjoyed meeting you as well. When we come back to Taiwan again, maybe you can show me how to make some Taiwanese desserts? Definitely! It’s also interesting to explore local foods. I just tried a bunch of very high quality soy sauces and vinegars that we bought on our last trip to the east coast (Hualien). Such a variety of flavors! There were interesting ice creams, confections and unfiltered artisanal beers as well… I hope I can show you around a bit the next time you come here! Yay! ANOTHER reason to return to Taiwan! That sounds like so much fun! Can’t wait to see both of you again! I really enjoyed your post “The Right Kind of Marmalade”. 🙂 I’m aiming to make Seville Orange marmalade this January, following my grandfather’s recipe. I live in Brooklyn, and so, was wondering, is Eastern Parkway and Nostrand the best place to get bitter oranges? Thanks so much, David. You can get seville oranges at most of the West Indian grocery stores in the neighborhood of Flatbush. They will be labled “sour oranges”. If you are near the Q and B trains go to Church Ave station. Leave the station by way of the Church Ave exit (not Caton Ave) and turn left as you leave the station. All the green grocers on that stretch of Church should have sour oranges. I have been getting them at the places on Flatbush Ave between Parkside and Caton because that is near my house. Good luck and Happy marmalade making! Thanks so much for the tip, much appreciated! D.
Please contact me regarding becoming a future Featured Food Blogger! Love your gluten-free recipes! I want to ask about putting one of your recipes in my book and want to e-mail you about it–can you send me a message lorihoney(at) telus (dot) net. We just found you and are so happy to join the rest of your followers! We must be gluten-free due to celiac disease and have been so for 12 years. Will definitely be browsing through your recipe index!! Thanks! Welcome! I hope you enjoy what you see. I need help with some one who can come teach 6 girls ages 9-11 how to make french Macaroons for my daughters birthday!! !